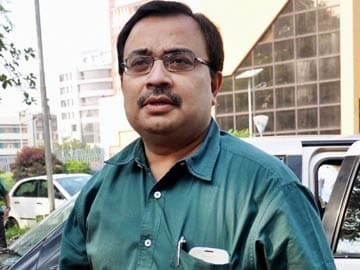 Kolkata: Journalist turned Trinamool Congress Rajya Sabha MP Kunal Ghosh was arrested in Kolkata on Saturday evening in connection with the Saradha chit fund scam. But within two hours of his arrest, Kunal Ghosh, in a Facebook post, named 12 people who, he said, could help the police unravel the scam. In that list of 12, there are names of at least four Trinamool MPs and Trinamool supremo and West Bengal Chief Minister Mamata Banerjee. Stunned by the Facebook post and its contents, police scrambled to find out how Mr Ghosh had managed to access social media after being arrested. However, Mr Ghosh had given enough warning of his intent. In a press conference on Friday, where he broke down in tears, the MP had said that the police had singled him out for questioning on the Saradha scam but was not interrogating many other members of his party who knew Saradha chairman Sudipta Sen - who is now behind bars - and had, directly or indirectly, benefited from him. Mr Ghosh had said, if he were arrested he would reveal the names. Besides Ms Banerjee, Ghosh's list of 12 names includes Trinamool MP and party general secretary Mukul Roy and MPs KD Singh and Srinjoy Bose. Madan Mitra, minister of transport in Ms Banerjee's government, is also named. Mr Ghosh does not say they were in any way involved in the Saradha scam but suggests the police seek their help to get to the bottom of the scam. Mr Ghosh was arrested for cheating, breach of trust and criminal conspiracy in what had come to be known as case 34, which relates to a complaint by a Saradha Group media outlet called Broadcast Worldwide about failure to pay salaries to its employees. Mr Ghosh, it may be recalled, was the Group CEO of Saradha's media empire. Scores of journalists were left without a job when the media outlets shut down after the Saradha Group went bust in April. "Kunal Ghosh was part of the conspiracy with Sudipta Sen and conspired in many of Sen's misdeeds," said Arnab Ghosh, deputy commissioner, detective department of the Bidhannagar Police Commissionerate. "According to evidence we have gathered, Kunal's involvement in the Saradha Group's misdeeds went well beyond his designated role," he added. Earlier in the day, Mr Ghosh filed a complaint against police officer Arnab Ghosh for intimidation. In his press conference on Friday, the Rajya Sabha MP had said Arnab Ghosh had threatened to arrest him if he could not give details about the Saradha Group's finances. Kunal Ghosh has insisted that he was a salaried employee of the Saradha Group and had no idea about its financial dealings. He will be produced in court on Sunday.